Graze the Roof: Graze the Roof Spring Workshop Series: Introduction to Beekeeping and Beehive Management! Graze the Roof Spring Workshop Series: Introduction to Beekeeping and Beehive Management! 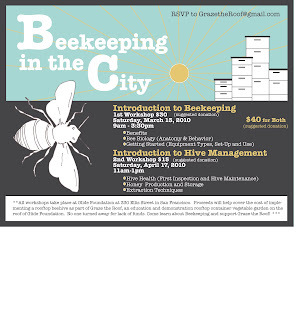 Graze the Roof would like to invite you to our spring workshop series on Beekeeping in the City. Susan Prentice and Paul Koski of the San Francisco Beekeepers Association will be co-facilitating both workshops and we invite you to learn alongside Graze the Roof, through this hands-on workshop series as we kick off our first season of Beekeeping on at Glide Foundation! RSVP to GrazetheRoof@gmail.com. You don't want to miss out! can i attend the hive health workshop if i did not attend the intro workshop?